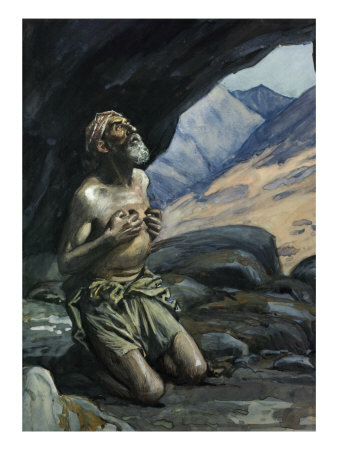 Elijah, on Mount Carmel challenged all the prophets of Baal. With total intervention of God he had won. Then we hear he is hiding in a cave and…. Why? He had “Moved a Mountain” with his faith in God, so it could not be his lack of faith. No. Now what was he afraid of? Seeing his hands, tongue and eyes being used by God. Being His instrument and seeing the “Wine Press” in action. I have to say after pondering this more, its much the same as the Agony of our Lord in the garden. To think at all our Lord was lacking in faith is absurd. Fear of the Lord, not in regards to what He would to to him, Elijah, but what is going to happen to others who refuse Him. Awe in its purest form. Seeing God in action, from the core of the innermost part of his soul is the most humbling experience a man can face, leaving no doubt, zero doubt, He is God and God’s will be done, not his, no matter how painful it will be. This is God’s consolation, coming to him, assuring him, what he is doing is God’s will and not his own. Ensuring Elijah, I, God, did that, not you. Then allowing Elijah to build fortitude, and continue on to complete the will of God.